The Ork dreadnought is on hold while I decide if I want to paint it up for display purposes, lacking it, I had to find something to paint in order to fulfill my Dreadtober pledge. Enter Epic 30k. I had a lot of fun painting up a full unit of these guys, even applying panel shading on them as if they were 28mm instead of 6mm models. 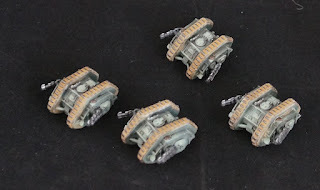 Since I had the paint out, I went ahead and painted up some land speeders, some original plastic land raiders, and three shadowswords for the force. The last shot is just a photo of what I have painted so far. Once I get some stands of infantry painted I will have a usable force. I've been holding on painting any infantry until I figure out how to base the minis. The crackle paint bases are serviceable, but rather dull. Haha. You Win John. You completely win! Oh you cunning cheat! Well played. The models look lovely themselves. Well done onthe really tiny details.